The yuan isn't the only thing getting weaker in China. So are shares of Chinese e-commerce giant Alibaba. Alibaba reported its second quarter results Wednesday morning. And even though earnings per share beat expectations by a penny, sales missed forecasts. The stock tumbled 7% in early trading on the news. Shares opened at their lowest level since the company went public nearly a year ago. Alibaba (BABA) is still growing pretty rapidly. Sales rose 28% from a year ago to $3.27 billion. Wall Street was expecting sales of $3.4 billion. Alibaba's growth rates is slowing though. Sales were up 44% in the second quarter of 2014, for example. But mobile revenue surged 225% and now accounts for more than half of Alibaba's overall sales. CEO Daniel Zhang struck an upbeat tone in the company's earnings release. "We had a strong quarter and we continued to build the foundations for future growth," Zhang said. Investors have a different view. The stock is down 30% this year and is nearly 40% below the peak price it hit last November. The company sent a signal to investors Wednesday that it thinks its stock is a value though. Alibaba announced a plan to repurchase up to $4 billion of its shares over the next two years. But that may not stop the bleeding. Concerns about fake goods on Alibaba's main e-commerce platforms Taobao and Tmall have not gone away. Zhang addressed this in the earnings release, saying that Alibaba is "improving the quality and sustainability of merchants doing business on our marketplaces." Alibaba is adding more big retailers to try and counter the perception that it is a haven for pirated products. To that end, Alibaba said Wednesday that Macy's (M) is going to set up a store on Tmall. Fears about the China in general are also hurting Alibaba. China's stock market has been insanely volatile over the past few months amidst signs that the economy is starting to lose steam. 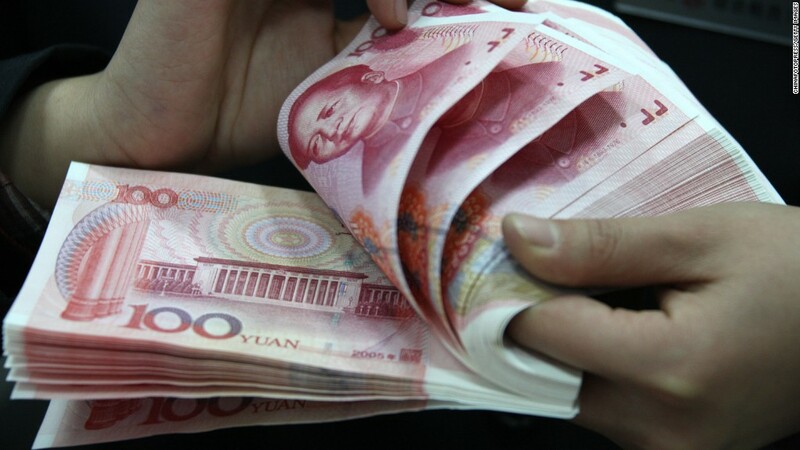 The surprise move by China this week to devalue its yuan currency isn't helping matters. Alibaba also faces tough competition from rival JD.com (JD), which is backed by Chinese mobile giant Tencent (TCEHY) and Saudi Prince Alwaleed bin Talal. Some investors have also questioned whether or not Alibaba's ambitions are too bold. The company could be spending too much. Founder Jack Ma has made it no secret that Alibaba wants to become a global tech powerhouse. The company has started up a cloud computing business, similar to what Amazon (AMZN) has successfully done. Cloud revenues are small so far, but they doubled from a year ago. Alibaba also recently named board member Michael Evans, a former investment banker at Goldman Sachs, as its new president in charge of international expansion. And in a somewhat curious move, Alibaba announced earlier this week that it was buying a 20% stake in Chinese electronics retailer Suning for $4.6 billion. That puts Alibaba into the brick-and-mortar retail world. It would be kind of like Amazon investing in Best Buy (BBY). So can Alibaba rebound? That remains to be seen. A lot depends on what happens in the Chinese economy. But Alibaba's sales miss is also bad news for Internet giant Yahoo. Yahoo (YHOO) owns about 384 million shares of Alibaba. CEO Marissa Mayer is hoping to spin off that stake, along with some other Yahoo assets, to shareholders as a separate company later this year. But as Alibaba's stock plunges, so does the value of Yahoo's stake. Shares of Yahoo fell more than 5% in early trading.